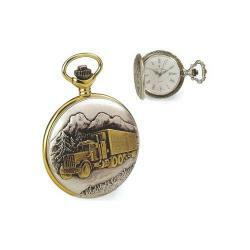 Jacques du Manoir Semi Truck Pocket Watch, white dial, brass case, Roman numerals, Swiss-quartz movement. Jacques du Manoir is a well known watch brand in Switzerland. Jacques du Manoir offers a wide reange of wristwatches as well as pocket watches made with genuine Swiss-made quartz and mechanical movements. Jacques du Manoir manufactures wonderful wristwatches with this classical touch that you only find on genuine Swiss watches. All the watches are Swiss-made and assembled by hand in Switzerland. They come in a gift box. All watches come with a 1-year international warranty with after-sale service in the U.S. Neat jewelry gift for big truck drivers!